Now I’m taking you back to last October’s Europe trip, where on the way to Dublin, we stopped over in Singapore and had a wonderful rendezvous with the Ritz-Carlton Millenia. After getting drunk on yummy cereal prawns in Singapore, it was travel blogging mode. We were, after all headed to one of the biggest travel blogging conferences, TBEX ’13 in Dublin. 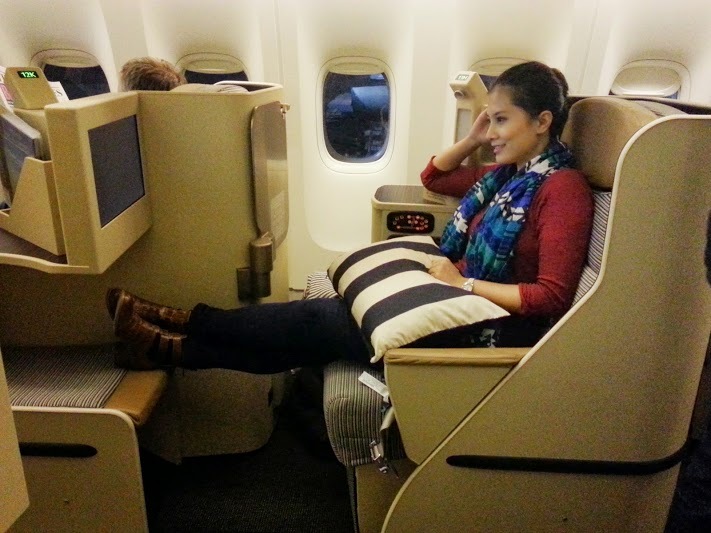 What I truly love with the Etihad business class cabin seat plan – all seats have access to the aisle! It’s in a 1-2-1 configuration. Each seat has a hardback shell, and it transforms into a fully lie-flat seat at a…(cliche coming up)…click of a button..
One thing I have to say about the obsession about seats that lie fully flat- in my personal experience, I never make the seat go all the way flat because it is actually uncomfortable. The best sleeping mode for me would have abit of an angle (like above). 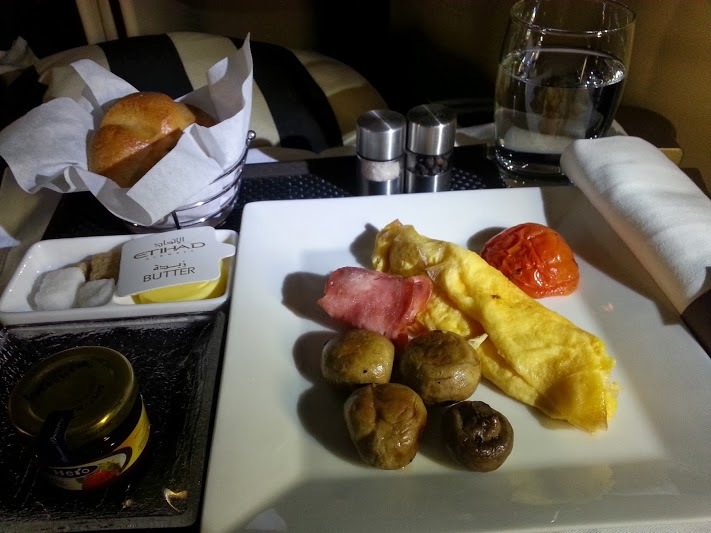 Etihad business class menu Abu Dhabi to Sydney. You gotta love the Kitchen Anytime service! 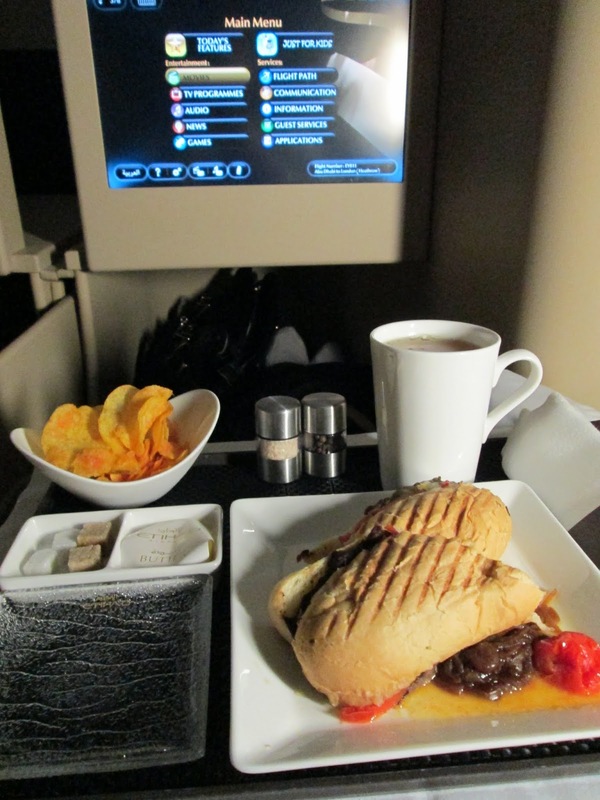 This particular flight from Abu Dhabi to Dublin was a red-eye, and there were 1.5 meals served. The .5 comes from the “Kitchen Anytime” menu, which was really handy for a flight that left at 2 in the morning. The “Kitchen Anytime” menu, I would describe as everyone’s dream pantry. You know those late nights when you’re up watching tv, a dvd series, YouTube-ing, you name it. And you want that perfect midnight snack or munchies? Well. 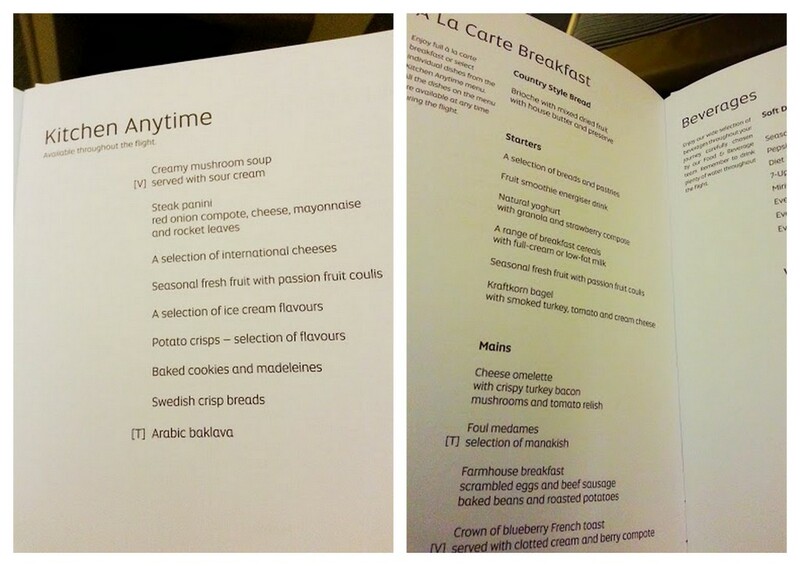 Here comes Etihad’s “Kitchen Anytime” menu. From steak sandwiches to ice cream, cookies, and potato chips, (and more!). 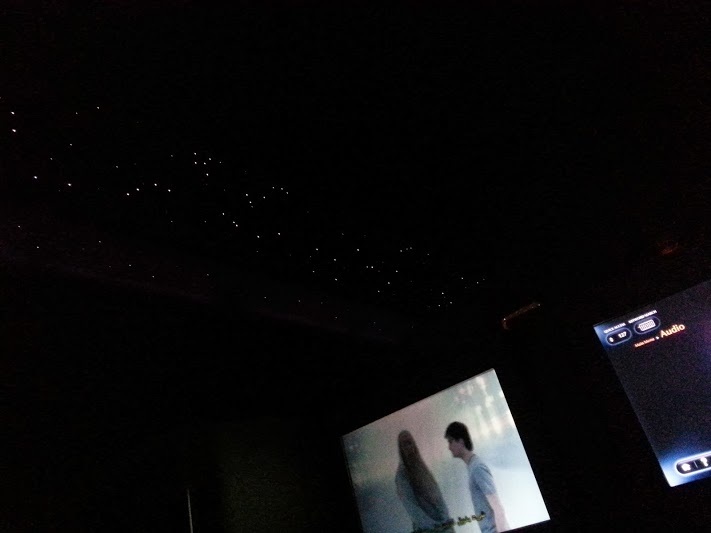 I loved the very dreamy and relaxing ambience. As Zombie finished the last Harry Potter movie, I tuned on to the Audio selection, selected “Relaxing Sounds”, and was fast asleep soon. Goodmorning! A few hours later, it was time for a very early breakfast. Zombie on the other hand had a full Farmhouse breakfast that consisted of scrambled eggs, beef sausage and baked beans. I truly appreciate fantastic customer service. I was once a cabin crew myself (and currently in the travel industry) and I know that sometimes this can be a very thankless and exhausting job. So when I encounter exceptional service, I really make sure I go out of my way to thank and appreciate people who go beyond their job description and show real passion and interest in what they do. Such as this flight , EY45 from Abu Dhabi to Dublin. The cabin crew assigned to our zone was exceptionally attentive (but not intrusive), and I liked that he was very particular about safety. When we reached a turbulent area and the captain announced to fasten seatbelts, not only did he walk around to make sure everyone was buckled, I saw him actually fasten Zombie’s seatbelt (who was so oblivious from sleep) – I’ve seen cabin crew who would wake passengers up to fasten their seatbelts, but this guy quickly did what needed to be done without causing a stir. He also spoke to us about our meal choices , and this is why I was able to request my extra toasty scrambled eggs, (and runny for Zombie). He took the time to know our preferences. This to me is one of a kind because on my past business class Etihad flights (and also on our flight out of Paris for this trip), we were just asked what we wanted in the menu, no other questions. His name is Deepak Pokhriyal, In-Flight Food and Beverage Manager. He used to work for a major hotel chain as F&B manager too, and moved to Etihad when the airline decided to have in-flight Food and Beverage managers on their flights. And we were lucky to encounter one who had exceptional customer service! He explained to us that while he was a qualified in-flight F&B manager, he was also trained as cabin crew. If you ever have the good luck to fly with him, I am sure you will enjoy your time. It wasn’t just him though. The entire business class crew on that particular flight just had a good vibe overall, and the Cabin Manager, Salah Kermoud, also went from seat to seat to engage passengers and ask them how they are finding the flight. Such exceptional service from this team! While I enjoyed amazing in-flight service, the Dublin Etihad arrivals ground crew brought me back to reality by being a downer. See, I left an entire plastic container’s worth of travel and conference documents in the aircraft (my fault, I know). And I realised this as we were getting out of Dublin airport. I of course ran back inside the airport in full speed to the arrivals counter of Etihad. As I explained to the lady in the counter what happened, she gave me a standard answer of “if anything was left in the aircraft, it would have been surrendered to us”. And she said all they were given was a pocketbook. I asked if I myself can check the cabin, and understandably this was denied (for security) , and she told me that the passengers from Dublin to Abu Dhabi (return flight) were already boarding. She didn’t offer any solution so I asked if someone can check again all overhead compartments in business class, particularly the seat I was in. I explained again and again it’s just a thin plastic box of documents so it may have been overlooked. She was hesitant to do this, but agreed in the end. So while someone else checked, she asked me to wait and after 15 minutes, she reported that nothing was found. And almost as a consolation line, she said that if I want to, I could file a report for a missing item, etc. But I know that it’s either they really didn’t see it, or another passenger may have mistakenly taken it. And while all the documents there were very important, they were replaceable thankfully! I didn’t bother reporting because the wonderful staff at our first hotel in Dublin, the Fitzwilliam Hotel, helped us re-print all the documents. And it’s not Etihad’s fault for my carelessness yes, but I’m calling the arrivals service a downer because of the lady’s attitude of non-urgency towards the situation. Standard one liner answers, not an active listener, and most of all not proactively offering a solution. 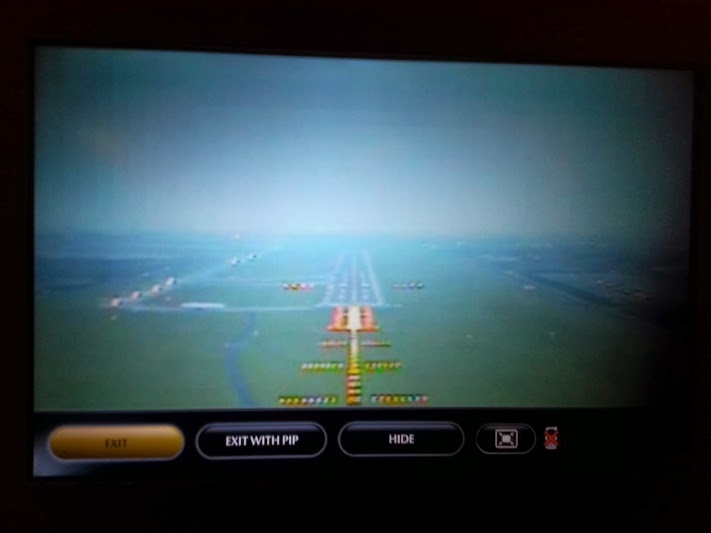 All of Etihad’s aircraft are equipped with a camera attached to the plane’s exterior. And you can always view them from the in-flight entertainment system. I still overall enjoyed my experience with Etihad, and while I will remember my initial experience at Dublin airport with lots of panic and running, I will remember our flight experience quite fondly. 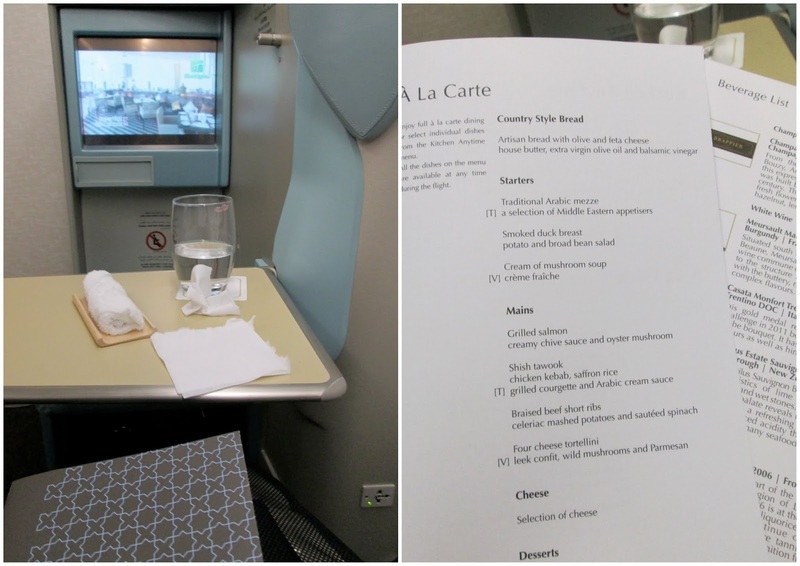 Etihad Business Class experience: Abu Dhabi to Dublin. This is NOT a Sponsored trip or affiliated post. We paid full price for a business class upgrade. I write about fantastic things (and the not so fantastic), whether they are hosted or not. Nice review! We know what’s going on inside the aircraft and at the airport, being in the travel industry too. So we have some expectations set in our minds as we also deliver the best to our passengers. But exceeding our expectations is something different, and pleasant, if I may say. Waiting for more reviews! And maybe see you again next time! Thanks Mayor 🙂 Yes when you work in the travel industry you know Both the minimum expectations so you won’t just take mediocre service and also you know the hard work behind it so you appreciate it when you get good service. Yes I really hope to see you again next time, on a much longer catch up! Wow, that’s fantastic! What a great experience! 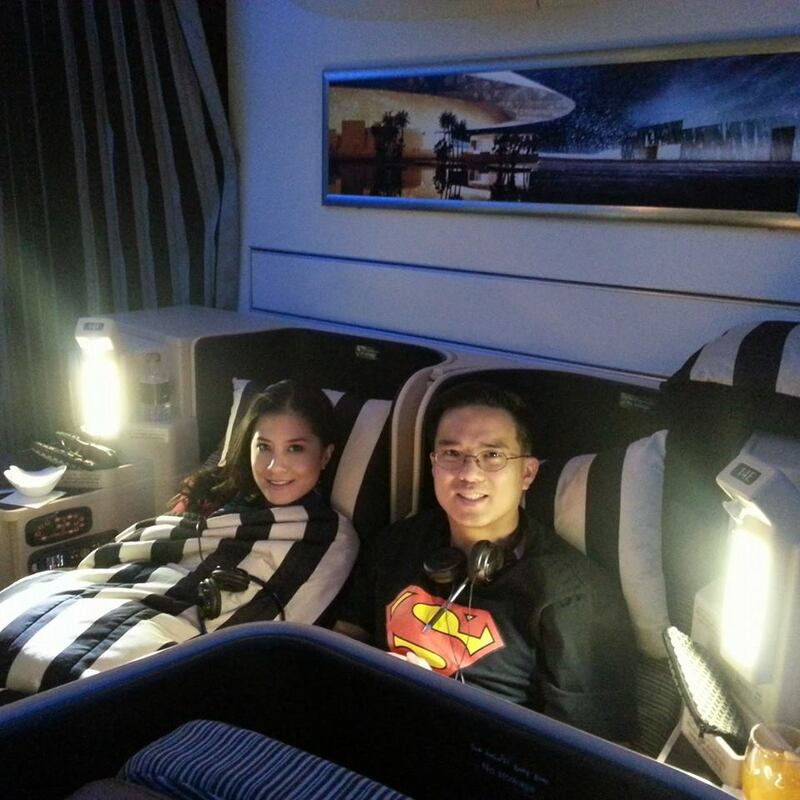 We’ve only flown overseas business class on Delta and Etihad is definitely better. Delta does not have flat bed seats up front on these planes, granted the transatlantic Delta flights from Europe to the US are shorter. I did notice a few years ago that Delta’s flight from Los Angeles to Sydney on their 777 had flat beds, unfortunately I was not up front! I’d love to fly Emirates one day too! 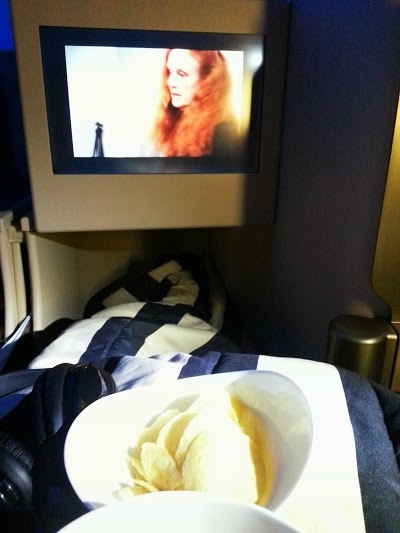 I found a few website that sells business class for less than the airline websites – WIN! 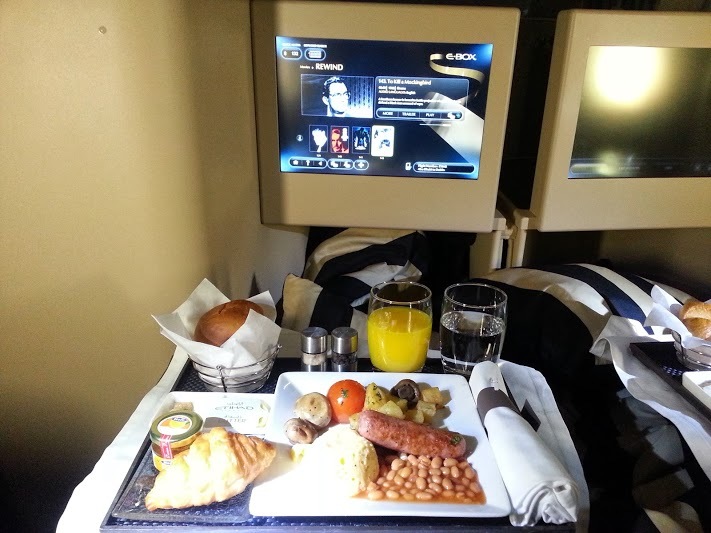 It really is all about service, and it looks like Etihad does it right! The breakfast looks so good. I’m going to take a look at what routes they fly because I’m not that familiar with them. Hi Ann, yes its worth checking their routes out they are expanding a lot, partnering with a lot of other airlines. Their ground staff really has a not so good reputation, I’ve also read a lot of other experience with less than stellar customer service. Where was yours (what airport)? and what was the situation? Great post Jean! And the service in the air sounds great. A bit of a shame about the ground crew-that would be such a panicky situation I’d imagine for you! Hi Lorraine! Thanks for the visit. Yes I really like their service, very attentive without being obtrusive. And yeah, tell me about it (panic situation at the airport). I’ve never ran so fast in ‘proper’ shoes! Im just so glad that what I left were replaceable! Nice review Jean! It seems you were luckier than us on our travel from Adbu Dhabi to Paris, where we enjoyed “another” business class that looked older. Anyway, Etihad has great onboard and ground services. Hi Francois, I read your review and I’m surprised Etihad still hasn’t updated all their aircraft. 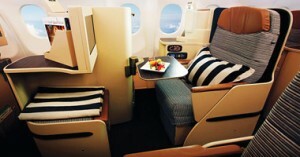 Yes the blue (Torquoise) and cream interiors are the older business class model. I also had a flight with it 2 years ago NYC – Abu Dhabi. The newer model (tan/brown) is indeed more modern.